This entry was posted in Skip Allen & Painter 12 and tagged Alpha Channels, Clone Source Panel, Cloning in Corel Painter 12, Corel Painter 12 Tutorial Video, Corel Painter 12 Watercolor Brushes, Skip Allen and Painter 12, Watercolor Iris. Bookmark the permalink. Skip .. thank you so much for taking your valuable time and creating these videos. Have downloaded them and hope to march through them. I think I need to take that stand alone class that you have regarding selections and channels to help get a good grip on this technique .. which I truly love! … again, thanks so much Skip. You are so welcome Charlie. I hope these videos will make sense. Every time I do something on channels I seem to confuse the issue. Siete i benvenuti. Grazie per la visita. Many thanks Skip for those very useful video. I will dive into them as soon as Karen’s Open session is over. Thanks Pierre. Hope to see you later in Karen’s webinar. You are welcome and thanks for dropping by. Hope you visit again. Oh wow Skip, what a huge amount of work must have gone into making these and preparing the brushes,etc. Thank you so much. It looks like an exciting project..can’t wait to watch and learn !! Judi btw: got the headset…. :-) goes under the hair behind..and falls down my neck…lol, but I guess I’ll get used to it…. Good to hear from you. It did take a while to prepare this post, but it was fun and that’s what counts. I am so glad you got the headset. Don’t put it under your hair. Open it up big enough to go on top of your hair, then push the band together making it a bit tighter and it should hold. If you get used to it, I know you will love it. Cool Skip! For me this is a much appreciated set of tutorials, although I now feel overwhelmed by the possibilities offered by multi channels x multi clones x countless brushes= m(b)illions of possibilities. My brainram is already maxed out and now I am having to really stretch the grey matter to take it all in. I admire your technical skills, your sense of humour and your perseverance, not not mention your considerable painting ability. See you at a class sometime soon. I have to agree about being overwhelmed by the possibilities. Painter 12.1 is a very complex program with a lot of depth. Everyday I find something new. I’m looking forward to seeing you in another class. You are very welcome. Thanks for visiting and posting to my blog. Well you did it again-Some fun and brushes also. You sure make me think. Are you going to do more watercolor class on other techniques (like the pen and ink with watercolor, Chinese art, landscapes and so on) ? Skip, me again……..Is the name of the brushes “Iris watercolor”..I don’t see that on my list. What name should I see ?? I upgraded to 12.1 and it seemed to work ok…just don’t see that name……?? 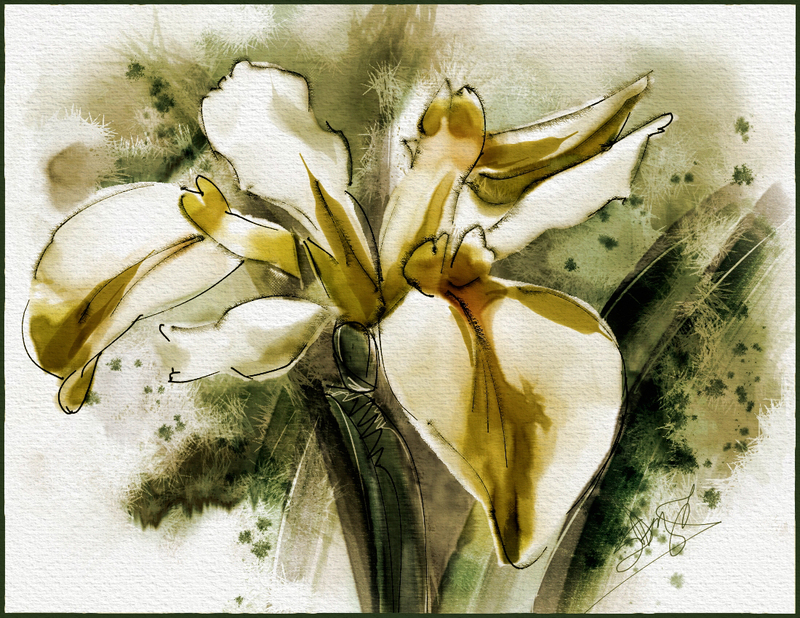 The brush category is called Watercolor Iris Tutorial. The download is available at the end of this post. When you download it and double click to install or use the menus, it will load into the library you currently have opened. So you need to look for the category in a library…don’t look for a library. Hi Skip and once again thanks for posting your knowledge about Painter! (Have to say I haven’t watched all the videos yet!) But I was wondering what paper are you using? in the video and what resolution? I’ve downloaded the Paper Drips paperlibrary, but cant find any similar to the nice one you use in your video. Good to hear from you. That paper is from Tim Shelbourne at The Artist Quarter. He had made some photos of watercolor paper and this one was Faebriano #5, I think. Anyway, he gave me a JPEG and I made a paper from the JPEG and also a pattern. I placed the pattern on the top layer of the image and reduced the opacity to get the right look and used the paper, too. That way I can get a double whammy with the textures. I hope to gather more in the future; you ought to try to make some, too. I think I’ll buy a sample book of papers, which will be just the right size to photograph and turn into papers and patterns. I followed your advice and made a pattern and also a paper, from an old watercolour paper I bought in India ages ago. This is just a try-out made quickly! It looks wonderful Kenneth. Watercolor paper from India bought ages ago sounds and looks intriguing. I love it. Thank you so much for including the link to see your try-out. Beside enjoying seeing the image, I have been wondering how I could include an image with the comments. Your solution is terrific. Thanks Skip it was made very quickly Well, I guess that not so many people have there own websites to upload to.Hope you find a solution! perhaps you have some address I could send you some of my Indian handmade JPEG to? Thanks Kenneth…would love the JPEG. I sent you my email. BTW, I love golden retrievers. I don’t have one right now, but will soon. These videos are great! Thanks. I have a problem with my selections, I receive a error ones I add to a selection I have black squares all over. Even when I save it correctly when I re-open the file and open the selection, the selection is not what I saved, it shows lines or squares all over. I get very frustrated I don’t know what to do. Let me ask a few questions and after you answer them, maybe I can think of something that could help. 2. When is the last time that you updated your video card driver? 3. Please tell me your preference performance settings. 4. Please tell me the steps you use to save a selection and what file format are you using to save? To save your custom stuff, you have several options. One is to go to each panel and export the custom palettes or panels that you may have made. If you are running Corel Painter 12.1, you can export your custom brushes as a category or library if they are in libraries. All of this stuff can then be imported back into your new install of painter. It is a good idea to save all this stuff anyway. Easier to do, you can export your workspace to a file on your computer. It will have all the custom stuff included in the export. Then in your new install, you will import your workspace back into Painter. But before you uninstall…answer my questions and lets see if there is something that might help other than installing a fresh copy. My video card was updated a month ago and I just check for new updates and windows did not find any news. My preference on painter has change friday following instructions from painter support and help a little bit, instead to have the error on the first minute now is about 3 minutes,. On memory usage = 80%, multicore usage=6, scratch driver now is on partition of c:/, one of the problems when I call support was that I could not select c;/ for my scratch driver, the only selection where external hardrives, they ask me to do a partition on c:/ an now I can see the option of the new partition. About the selection, it happen when I use the magic wand, when I use lasso tool, and when I do channels and selection from channels. The odd thing is that I can see the selection fine, when I open the file again the selection is completely wrong, nothing to do with the selection I saved. I am saved it in rif. I already install everything yesterday night and the problem is the same, the files size that I have 380MB, the other is 46MB same problems. Other things I notice is taken a lot of time to open any file in painter between 45seconds to 1 minute the same for saving. Another thing, when I see the black squares all over I close everything including windows, next day sometimes the squares are not there, then I begin to work a little and square appear again, I do not save the file just closed, open the file again the squares again show up. When I change brushes take more time, when I send a canvas layer to watercolor layer it take time, this did not happen before the last update. I think it is fixed now, Chris contact me and ask me to hold “shift” when I open painter and I have been playing with selections without any problems. I was getting so frustrating. That’s great Lucia. Sorry I hadn’t thought of the shift start. I think of it as a last resort. I’m so glad it worked for you. Thanks to Chris, too.